Royal Air Force (RAF) and Royal Canadian Air Force (RCAF) squadrons normally had 12 aircraft each; when the squadron attacked, the planes split up into groups of three or four. A Luftwaffe Heinkel He-111 bomber shot down during the Battle of Britain. National Archives of Canada, PA-128127. At the beginning of WWII pilots were trained to fly in close formations, either V-shaped (called “vics”) or lined-up. When a target was located, an enemy bomber for instance, the fighters would try to sneak up on it by hiding in clouds or by positioning themselves with the sun’s blinding rays in their back. As much as possible, they would attack from the rear to avoid being seen and to remain as long as possible out of reach of the enemy’s machine-guns. The formation had to be maintained at all times: upon the squadron leader’ s signal they would all together dive on the target, taking turns at firing. Against enemy fighters, attacking from behind and from a higher position was the most efficient method as the target presented a broader surface and was in no position to fire back. 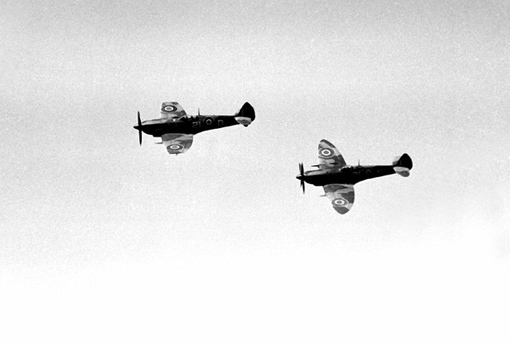 The first combats of the Battle of Britain demonstrated that maintaining the flight formation when attacking was dangerous. Not only pilots had to constantly monitor their teammates’ positions, but also the formation itself was an easy target. An enemy fighter could easily sneak up behind a “vic” and fire before being detected. 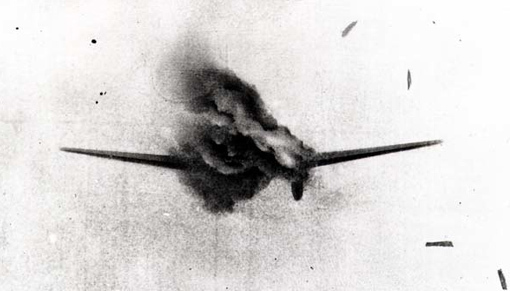 The squadron leader would realize his unit was being attacked only by seeing his teammate shot down in flames, often finding out at the same time that he was next in line. To solve this problem a fourth plane was added at the rear of the “vic”, a dangerous position, as he was likely to be the first victim. A two-Spitfire team from No 443 Squadron, 1945. National Defence Image Library, PL 43161. Later, looser formations were adopted: fighters would team up two by two, the first plane directing the attack, while the second one, the “wingman” covered the rear. Some squadrons grouped together two such teams to create a “finger four” formation. The section leader would fly up front with his wingman on the sun side covering the opposite direction. The second pair flew opposite to the sun from the leader’s point of view, covering the zone against the sun, which is the most vulnerable. Planes flew at about 200 metres from one another but at different altitudes to better protect each other and to monitor a broader area. If attacked, the two teams split up, one turning left, the other right. Canadian airmen often used the “finger four” formation for fighter operations over Europe in 1944 and 1945. The Tools of War 1939/45, Reader’s Digest, 1969.